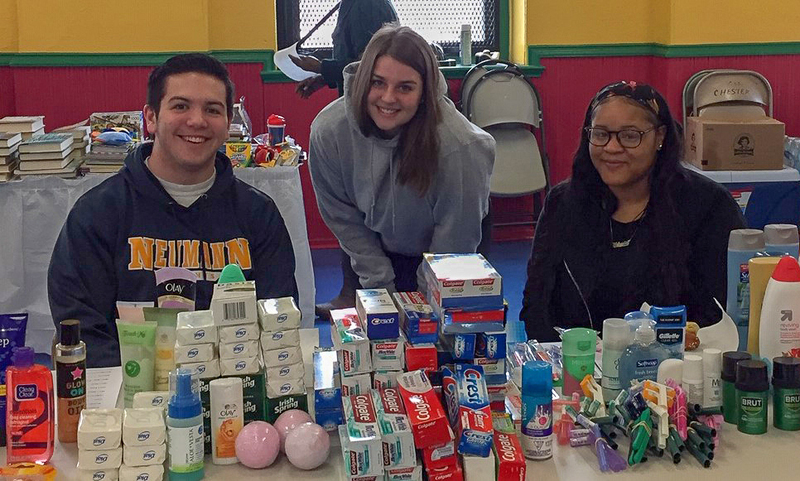 In March, Social Work majors collaborated with Catholic Social Services in Chester, PA, to run a clothing and toiletry flea market. The event was open to clients who use the various services provided in Chester: a coffee club, parenting classes, refugee resettlement, and more. The event was the brainchild of Bridget Lozier, a graduating senior in the social work program who completed her internship at Catholic Social Services. Her supervisor challenged her to come up with an idea to serve the Chester community, and Bridget devised a plan to collect clothes and have a community flea market. She was able to get the entire social work program at Neumann behind the cause. Bridget explained, “It was an amazing experience to have the opportunity to serve the Chester community through my internship at Catholic Social Services. Planning began back in October. It was a lot of hard work, but the support I received from the NU students in the social work program helped to make it an extremely rewarding experience”. The students engaged the university community in the project by placing collection boxes for clothing and toiletries at various locations on campus. Danielle McNichol, university legal counsel, contributed a van full of clothing that she had collected for her Wardrobes for Work program. After 25 students spent a day transforming an empty gym into a flea market and labeling items with prices, six of them returned for a second day, staffing the tables and helping clients find clothing or other necessities. Shoes, winter jackets, toiletries, blankets, and other articles were available. Each visitor was given fake money worth $10 with which to shop. Most items were marked between $1 and $3. “March is Social Work Month so each year we try to plan an event that recognizes and promotes the Social Work profession and engages our students in service. We have also tried to partner with agencies that are hosting one of our current seniors for field placement (internship) activities,” said Rina Keller, assistant professor of Social Work. “Our students participated in this activity with enthusiasm and joy and demonstrated a commitment to this program and their chosen profession,” she concluded.